Having family and friends who live on the coastlines of North Carolina, South Carolina, Florida, and the Gulf Coast, I find myself glued to the weather stations following the latest hurricane reports whenever late August rolls around. Today, folks along the Gulf Coast and particularly Plaquemines Parish outside of New Orleans are dealing with the wind and flood damage of slow-moving Hurricane Isaac that made landfall on the seventh anniversary of the devastating Hurricane Katrina on August 28, 2005. Thus, it seems like a good time to talk about the great work of the U.S. Geological Survey (USGS) and their role in hurricane response and prediction of their impact. the one of interest to us today, Coastal & Marine Geology. The Coastal and Marine Geology Program conducts research on changes in the coastal and marine environment, whether naturally occurring or human induced. Contributing to the Natural Hazards mission, the program supports research on marine geohazards including earthquakes, tsunami, and underwater landslides, and on coastal change hazards from sea-level rise, erosion, and extreme storms including hurricanes. While the National Oceanic and Atmospheric Administration (NOAA) and its National Weather Service is responsible for tracking and predicting the course of hurricanes (See the National Hurricane Center), the USGS’s research “focuses on understanding the magnitude and variability of the impacts of hurricanes and extreme storms on the sandy beaches of the United States. The overall objective is to improve the capability to predict coastal change that results from severe storms” and to “support management of coastal infrastructure, resources, and safety. USGS science helps identify areas that may need to be evacuated due to their extreme vulnerability to hurricanes or where preventive measures are needed to mitigate some of their damaging effects. When hurricanes strike, you can find critical information to help protect lives and property at the U.S. Geological Survey (USGS) hurricane website. Science and the Storms: The USGS Response to the Hurricanes of 2005 reports on the many and varied activities performed by the USGS in response to the four major hurricanes—Dennis, Katrina, Rita and Wilma— that hit the United States during that year. Topics vary from flooding and water quality to landscape and ecosystem impacts, from geotechnical reconnaissance to analyzing the collapse of bridges and estimating the volume of debris caused by the hurricanes. [USGS scientists] have measured and studied flooding and water quality. They have used the latest technology—from satellite imagery and geographic information systems to lidar (light detection and ranging)—to view and analyze damage to the barrier islands and coastal wetlands that protect people and property. They have examined the effects of hurricanes on land, water, vegetation, and wildlife. Examining the cycles of hurricanes and their relation to sea water surface temperature. Studying the flood protection systems in New Orleans and surrounding areas. Recording the effects of the hurricanes on manatees off the coast of Florida and on birds whose fall migration was disrupted by these ferocious storms. Analyzing the destruction of bridges and measuring debris. Studying the landscape of the Gulf Coast and measuring the enormous changes due to hurricane winds and flooding. Chapter 1:The Need for Science in Restoring Resilience to the Northern Gulf of Mexico is an essay establishing the need for science in building a resilient coast. Chapter 3: Rescue and Response, documents the U.S. Geological Survey’s (USGS) humanitarian rescue operations as well as its scientific responses to assess damages from the hurricanes, from the Mississippi River flood-protection system and bridges and to assess the coastal debris, oil slicks, and flooding in New Orleans. Rescue operations by USGS personnel included boat rescue, delivery of food and water to isolated communities, and the geoaddressing of 911 calls, which merited the USGS a Service to America Medal award. This was one of the more interesting stories in the book, showing how important fast-acting science can be in an emergency. As New Orleans’ streets flooded, emergency response officials suddenly realized that water rescue in a major metropolitan area was not a contingency they had planned for and that many emergency responders could not locate specific streets if they were all underwater, unrecognizable, or unfindable. Thus, the U.S. Geological Survey (USGS) was asked to apply geoaddressing to convert New Orleans street addresses on emergency calls into latitudinal and longitudinal coordinates that could be located by compass and GPS-wielding emergency responders in the field- on boats, in the air, or on land. The result was a database that USGS built in which each emergency call was represented by a point in a geographic information system (GIS). This data ended up being provided to a variety of emergency personnel and scientists from: the Louisiana Department of Wildlife and Fisheries (LDWF), the Louisiana State Police (LSP), the Louisiana Office of Homeland Security and Emergency Preparedness, Federal Emergency Management Agency (FEMA), Centers for Disease Control and Prevention (CDC), and Louisiana Geological Survey. Chapter 4: How Technology Helps describes some of the critical technology that enables U.S. Geological Survey scientists to assess conditions before and after storms, including: near real-time geospatial monitoring systems, geospatial support for emergency responders, Web-accessible data, and satellite imagery. Chapter 5: Landscape Changes documents the more severe changes to the Gulf Coast landscape resulting from these four hurricanes from Alabama to Texas, including plunging hundreds of miles of Louisiana coastline underwater; estuarine damage to barrier islands; erosion of beaches ; and the damages and loss of floodplain forest. Chapter 6: Ecological Impacts covers the hurricanes’ effects on both vegetation and the animals that depend on Gulf Coast habitats on land and in water. Discussed in this section are migratory birds, coastal marsh vegetation, chenier forests, coastal floodplain forests, mangrove forests, estuaries, and the endangered manatee. 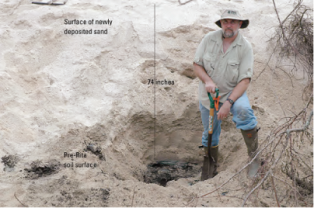 Image: USGS scientist illustrates the depth of sand deposition (74 inches) from Hurricane Rita in 2005 on Hackberry Beach chenier in Louisiana. Source: USGS Science and the Storms. Chapter 7: Aquatic Environments reports on the many studies performed by USGS scientists devoted to analyzing waters affected by the flooding from the storms of 2005 and the chemical composition of contaminated sediments. 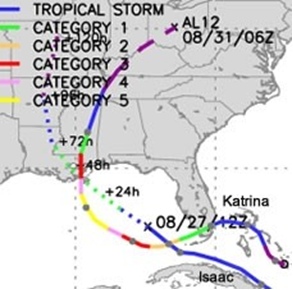 Chapter 8: Science and the Storms: the Science Continues is a compilation of relevant ongoing and future hurricane research for restoring a resilient coast. Epilogue: The epilogue marks the second year anniversary of Hurricane Katrina. Usefully, both English and metric measurements are used in the articles in anticipation of both general and scientific audiences in the United States and elsewhere, and the entire report is peer-reviewed to ensure the integrity and independence of the findings. Furthermore, the publications is chock full of color photographs, illustrations and graphs, bringing the facts alive and conveying the stark devastation of a hurricane-ravaged coastline, such as before and after photographs of the Chandeleur Islands in Louisiana. Thus, the purpose of Science and the Storms: The USGS Response to the Hurricanes of 2005 was to inform the American people of the USGS science that is available and ongoing in regard to hurricanes. Hopefully, the lessons learned by USGS following the Hurricanes of 2005 will help inform our response to hurricanes in 2012. HOW CAN YOU OBTAIN a print copy of Science and the Storms: The USGS Response to the Hurricanes of 2005? This entry was posted on Thursday, August 30th, 2012 at 8:25 pm and is filed under Department of the Interior, Gulf Coast. You can follow any responses to this entry through the RSS 2.0 feed. You can leave a response, or trackback from your own site. Like a human that who has many characteristics with its lifestyle, hurricane does also like that. Hurricane is different if we compare with the earth, or the sea, or the sky, or the sun, which is introvert : calm, smile, and stable. Hurricane was temperamental, rock n’ roll, eccentric and sometimes become the killers……..!